Looking for a new snack that can be ready in a flash? We’ve got you covered. 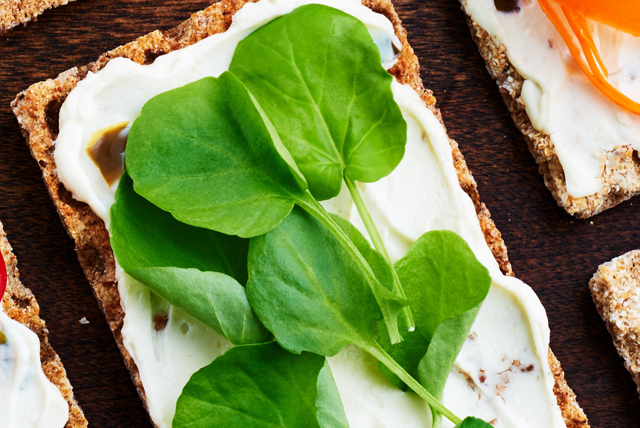 Here the peppery watercress is the perfect flavour complement to the spicy jalapeño-flavoured cream cheese for the perfect anytime snack. Spread crispbread with cream cheese product. Substitute baby arugula for the watercress. Try these delicious variations of this satisfying in-a-minute snack: Jalapeño and Tomato Snack, Jalapeño and Shaved Carrot Snack, Jalapeño and Sliced Avocado Snack, Jalapeño and Cucumber Snack, and Jalapeño and Pineapple Snack.